Sexuality, partnership and marriage present us with some of the most difficult challenges and questions of our time. With society's attitudes in constant flux, some of these questions appear to be almost unanswerable. What is a healthy relationship? What role should a partner - whether male or female - play? How should sexuality play into a relationship? Are marriage and monogamy still relevant in the twenty-first century? In this invaluable collection of accessible interviews and lectures, the author deals with these and many other questions with refreshing candour. Having gained much knowledge from his many years' work as a priest, marriage counsellor and his studies of anthroposophy, Gädeke approach is full of spiritual insight but simultaneously frank, practical and down-to-earth. 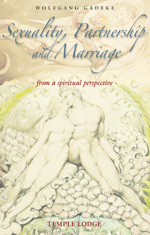 Among the themes discussed are: overcoming the inability to communicate; finding one's essential self within a marriage; the role of children in a relationship; sexuality and children; perversions; the role of counselling; relationships and monogamy; the concept of marriage and its spiritual repercussions; biological and soul differences; and, the fundamental sexual polarity of man and woman. WOLFGANG C. GÄDEKE was born in Bremen in 1943. He studied Protestant and Catholic theology, and was ordained as a priest of the Christian Community in Stuttgart. He has worked as a priest, a marriage guidance counsellor, taught at the Priests' Seminary in Stuttgart, and held courses on marriage. Since 1990 he has been a director of the Christian Community in North Germany.